In July, I traveled to Baltimore, Maryland (USA) with my DRRI to meet with Mikey. I arrived in the early afternoon and took copious notes to share the experience with you. Here’s how we spent the day, including a lot more information that I learned about rebuilding this DRRI amplifier. Once I arrived, I carried my two favorite Hamer guitars and my DRRI amp in from the car and met Mikey for the first time, and his two cats. One cat is unabashedly friendly and the other one is quite reserved and timid. After getting the animal familiarities out of the way, Mikey and I took some time to get to know each other. I asked him about his business name, MikeyMann Amplification. He shared with me that once when visiting his oldest niece, she spontaneously said, " Hey, Uncle Mikey Man!" Then, whenever she saw him, she’d call him “Uncle Mikey Man”. This term of endearment has been used by all of his nieces over the years, which is how the name MikeyMann Amplification came to be. We then talked about our love of tube amplifiers, guitars and the musicians that have influenced us. We shared war stories of bands we had played in over the years and most importantly, discussed the amps we’ve played in the past and the amps we own today. We also discussed the state-of-the-art in modern tube amp construction and spoke of the knowledge we’ve both gained by participating in the AGA newsgroup (alt.guitar.amps). We also discussed a host of Internet sites, tube amp books and interactions with other musicians that have helped us out. I’ve learned a lot from the Gear Page forum. “It's my favorite publication, even above Guitar Player. I look forward to receiving it each month, and I devour it for its information and knowledge. I save all of my issues so that I can refer back to specific articles and information. It's also cool to read what some of the great players are using, how they have their rigs set up, etc.” I like it too. Mikey is a joy to talk to about these topics and we spent the first couple of hours in animated conversation. Mikey took the time to talk about his vision of rebuilding reissue amps with modern construction techniques using the best of modern components. 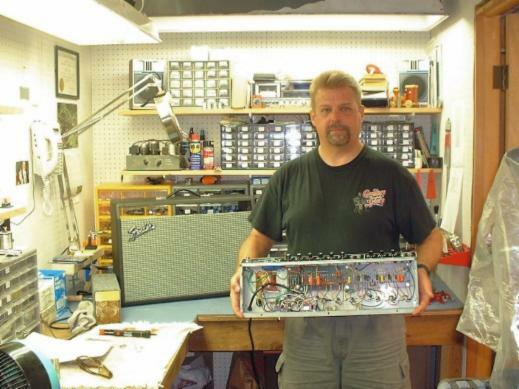 His vision is to build amps for working musicians, pros, semi-pros and serious players who want the best possible tone and top-notch reliability. He makes a compelling case for using the cabinet, chassis and some of the components of the Fender reissue series instead of buying an old Blackface or Silverface amp and only upgrading some of the components, leaving 30 – 40 year old components in place that could fail at an inopportune time. After our very pleasant and wide-ranging conversation, it was time to delve into the details of the amp rebuild. Copyright 2010, 2011. No text, images or links may be used without express, written permission.